Heater casing made of Steel, S.S. 304.316, Titanium & Glass. A wide selection of kilowatt ratings shapes and mounting methods are available to suit many different types of applications. water, air, oils, solvents, plating baths, phosphatizing, evaporating solution. Heavy duty, long lasting construction. Standard thermal protection. Fully grounded for safety. Different voltages and wattages. Various control options. WATTS: 100 to 30,000 watts. 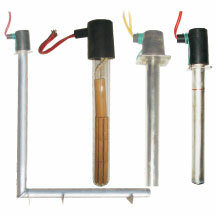 VOLTS: 120 V, 240 V, 480 V, single & three phase.